The controversial Grand Canyon Skywalk opened with much success in March of 2007, becoming the highest man-made structure in the world. 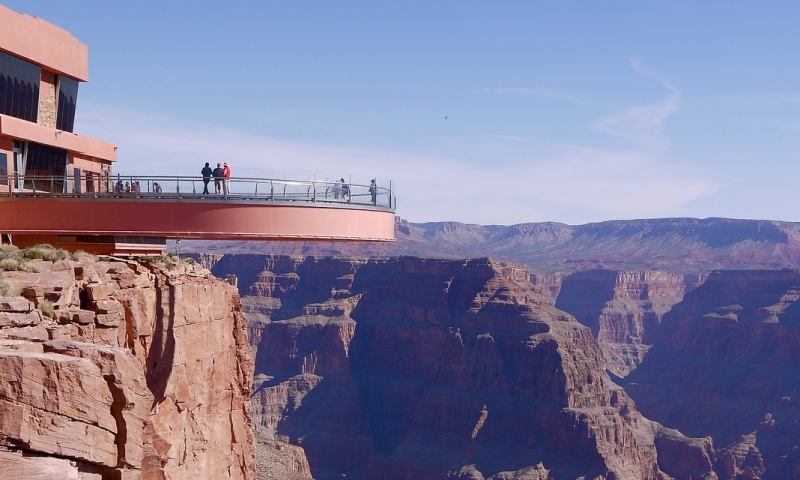 Arguably one of the most interesting modern architectural approaches to viewing natural beauty as profound as that of the Grand Canyon, the Skywalk comprises an impressive U-shaped glass bridge cantilevered 4,000 feet in the air over the edge of the canyon. An experience unlike any other, walk on a glass surface 4,000 feet above the canyon floor. Admission to the Skywalk also includes admission to the Grand Canyon West Entrance, located within the Hualapai Nation. To visit the skywalk, you need to purchase the Legacy Gold Package which includes the Skywalk ticket, Meal at viewpoint of your choice, Photo opportunities with Hualapai Members, and Hop-on-Hop-off shuttle to all 3 viewpoints. Constructed over a period of three years out of almost a million pounds of steel, the Skywalk presents a truly impressive vista. Designed around the concept of experiencing the majestic canyon as an eagle soars, this eagle-eye view gazes down through more than four inches of reinforced glass at the Colorado River 4,000 feet below. By contrast, the Empire State Building reaches a mere 1,454 feet above New York's Fifth Avenue. Over 200,000 visitors have experienced the Skywalk's gut-dropping view since its grand opening in March 2007—and the structure's unbelievable engineering has received even more attention. Drilled into 230 million year old Kaibab Limestone, the Skywalk conveys an almost weightless appearance, despite being able to support 71 million pounds and over 100 mile an hour winds. Developed by the local Native American Hualapai tribe with the help of entrepreneur David Jin, the Skywalk is part of a larger tourist destination marketed as Grand Canyon West. Leaders of the Hualapai joined forces with Jin in order to create a more solid economic structure for the feature of their tribe, using the one thing given to them by the U.S. Government: their land. Grand Canyon West aims at becoming an all-inclusive, independent destination beyond government-operated Grand Canyon National Park, and visitors should expect to pay an all-inclusive price. Still, this unique monument is a testament to the ingenuity of mankind—and a pretty nice view!